I’ve been sitting on this one for a while but here it is! 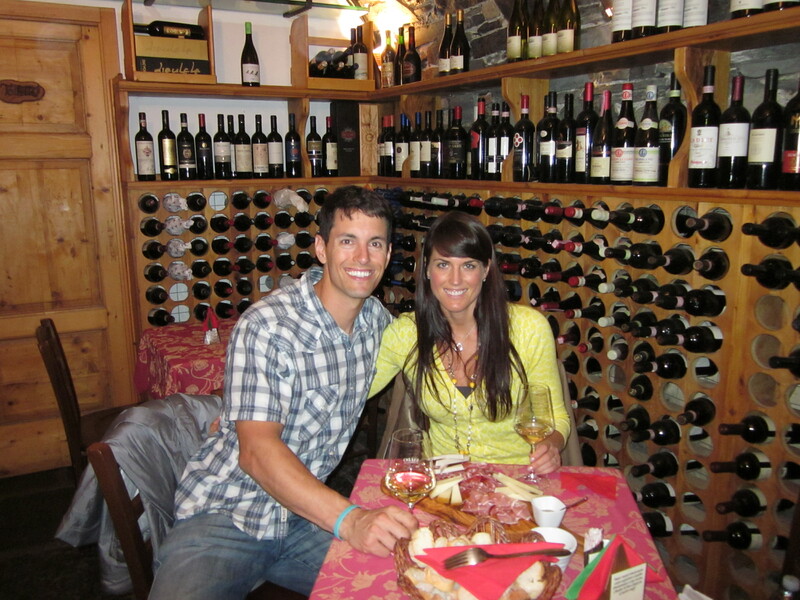 Our honeymoon in Italy was amazing. 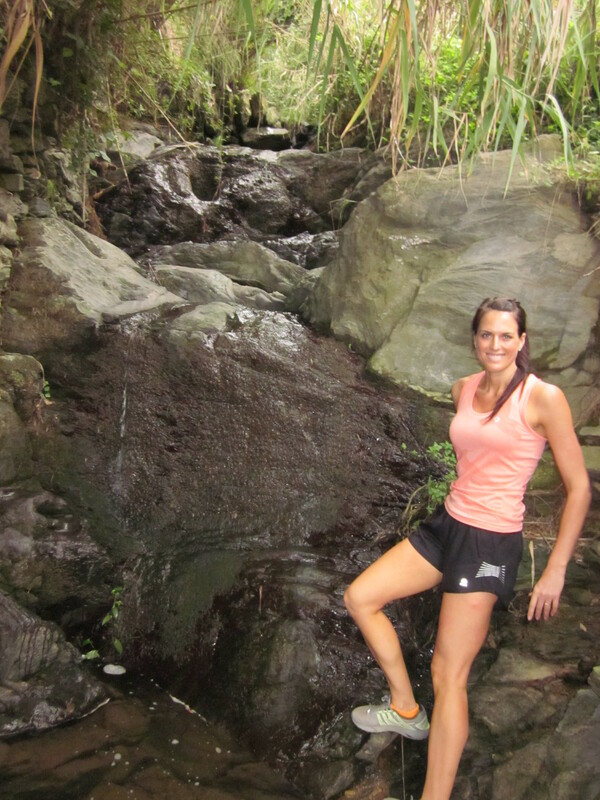 The culture, food, architecture, scenery and sights were spectacular and we were on honeymoon high for the entire trip. We began in Lake Como. 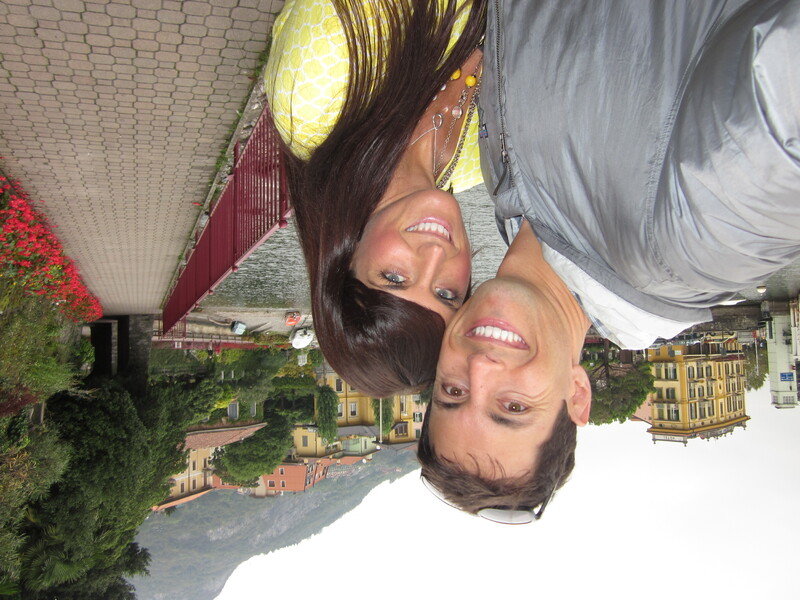 After a ridiculously long commute, we arrived at our hotel in Varenna, one of the many towns along Lake Como. We mistook the first “Albergo” we saw for our hotel, as we did not know that the Albergo in our hotel’s name just simply meant “hotel” and ended up in a very confusing situation with two men who spoke little English in the restaurant of their tiny “albergo.” Eventually an American man spoke up and told us that there were several “albergos” in town and directed us farther down the road. We blame the mistake on lack of sleep! After checking in to the real albergo, we took a moonlit stroll through the very narrow and cobble stoned streets of Varenna. Mike immediately admitted that his doubts that Italy would be any different than San Diego weren’t warranted and that Italy indeed was unlike anywhere he’d ever been. We found a tiny gelato place that was closing shop and begged them to feed us and ate our first Italian gelato as a married couple on a bench overlooking the lake with a lone white swan to keep us company. The next day we were awoken with breakfast in bed (included in our honeymoon package!) which we picked at and laughed at (meat, cheese and tons of bread with a side of fruit and a lone boiled egg) and then devoured. We took a ferry over to the neighboring town of Bellagio for the day and quickly discovered it looked nothing like the Las Vegas hotel that is named after it. Of course it was still beautiful and we enjoyed our first Italian meal at a beautiful outdoor restaurant on the lake. We spent the next couple of hours exploring the town and trying to ignore the women who were blatantly staring at my open toed sandals on a somewhat cold day (unfortunately it wasn’t beach weather in Lake Como while we were there but us Californians wear sandals year round!). We then continued the trend of gluttony by heading to a small wine bar that my friend Jill recommended for a wine, cheese and meat deal that couldn’t be passed up. As mostly non meat eater, “When in Rome” is my motto especially when in foreign countries so I did dip into the salami a few times and it was delicious! After heading home it was nap time and then we sat outside for dinner in one of the cobble stoned pathways. 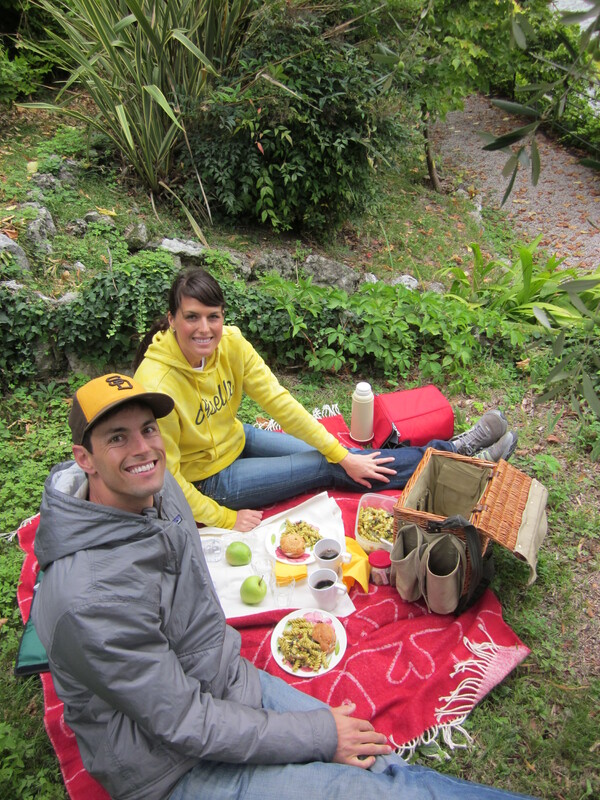 The next day we enjoyed a picnic on the lake courtesy of our hotel’s honeymoon package and then took long walk to a neighboring town and then hiked to the castle at the top of Varenna. We finished our lake Como saga with champagne on our hotel balcony and a wonderful four course meal at our highly rated hotel restaurant (also included in our honeymoon package!). Romance! 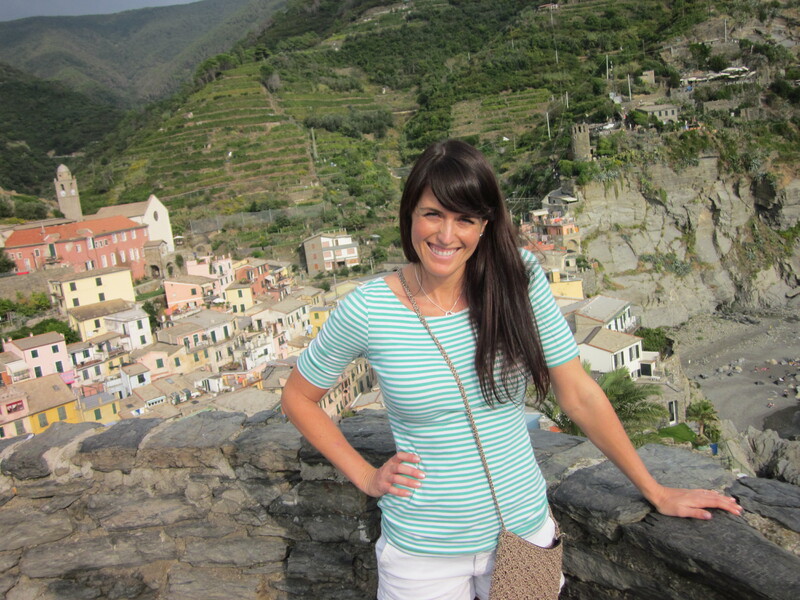 Although Lake Como was wonderful, I was over the moon when we arrived by train to Cinque Terre. The sun was reflecting off of the colorful buildings that dotted the jagged cliffs looming over the Ligurian Sea and cast a wonderful warmth over the tiny town. I changed into shorts and we spent the afternoon exploring the tiny village of Vernazza where our hotel was located, the majority of which sits right on the harbor. We ate what Cinque Terre is famous for – pesto – for dinner at a restaurant on the square and anticipated our hike the next day. The Cinque Terre is a region which is composed of five small towns which are connected via marked trails (or a train if you want). There are four popular paths, only two of which were open while we were there due to weather and the flood that devastated the region two years ago. Fortunately, there are other, albeit more challenging paths that link the towns together and Mike and I spent the majority of our time on these paths. We did take the traditional trails most traveled a few times and inevitably spent some time on the side of the trail waiting for others to pass as they were crowded (not unbearably so). 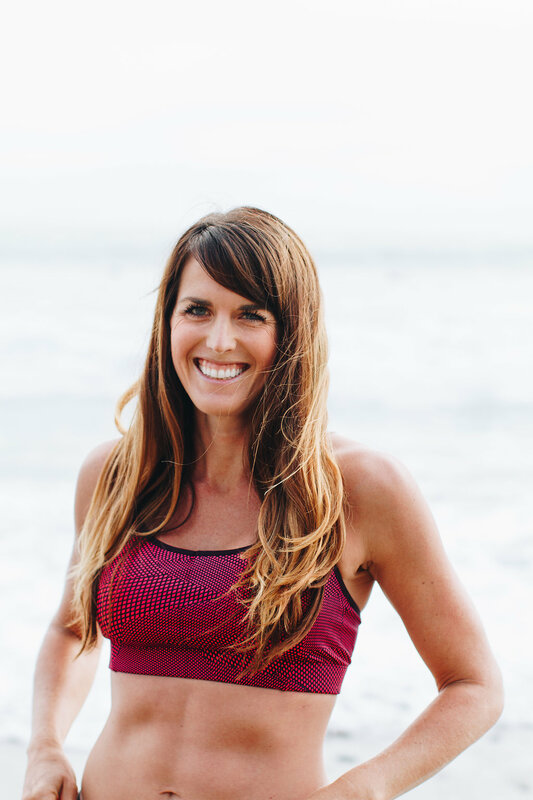 We’d hike about 1.5 hours or more at a time and then stop in a town for coffee, gelato, focaccia bread, pizza, a drink, or a sandwich, depending on our mood and the time of day. It was literally a hiking/eating tour. It was heaven. We followed this pattern both days that we were there and had a ball. 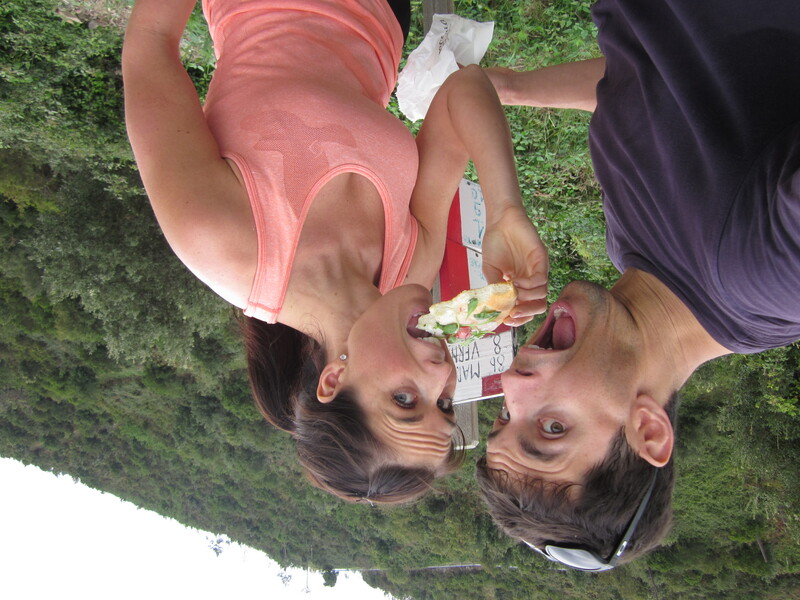 The 2nd day we found our favorite trail which was nearly deserted and wound between Manarola and Cornligia. We climbed up stairs for eternity at first, passed through dense forest at one point and then at other times we were teetering on tiny pathways on the edge of looming cliffs, surrounded for miles by gorgeous vineyards, the snarling vines heavy with fruit. We stopped to take photos, take in the scenery, get in a quick kiss or hug, nibble on a piece of focaccia or simply just talk about how amazing it was. If there’s one day (after our wedding day of course!) 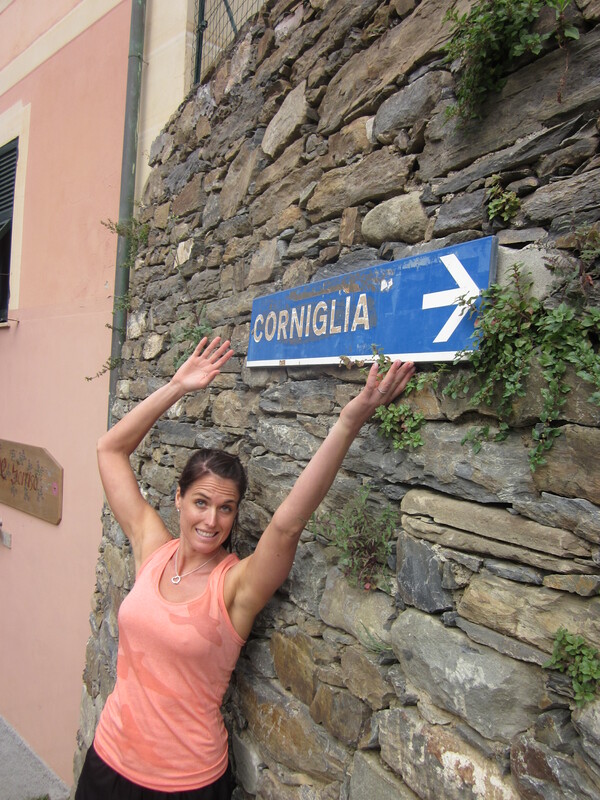 I’d relive in my life, the 2nd day in the Cinque Terre may be one of them. It was magical. We left Cinque Terre sad to go. We could have easily spent another day exploring and vowed we’d return for our 30th anniversary (as we had met a couple at dinner the night before who was there for their 30th and as we were halfway through a liter of wine, we promptly decided we’d copy them). The next section of our adventure took us through the gorgeous hills of Tuscany. We rented a car in La Spezia and drove it straight to Pisa so we could witness what all other tourists in Italy do – the Leaning Tower of Pisa. We ate pizza for lunch in honor of Mike’s confusion that we weren’t visiting the Leaning Tower of Pizza instead. 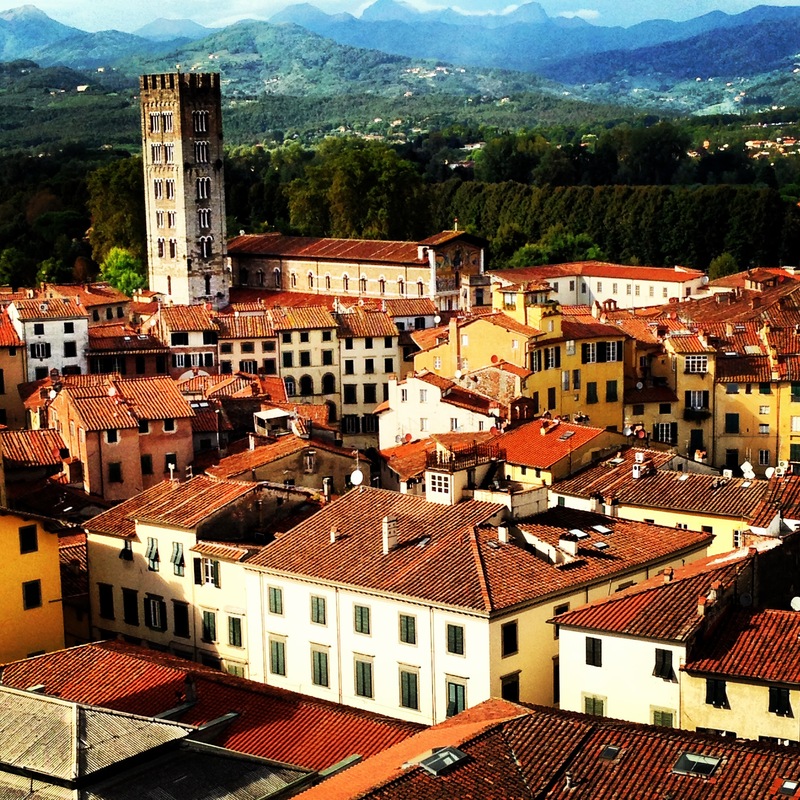 After getting lost for the 2nd time in the 4 hours we’d been in possession of our rental car, we made our way to our overnight destination – the town of Lucca. Lucca is a unique in that the main portion of town is surrounded by a 2.5 mile wall which has been standing for over a century. It is one of the few walled cities that has never been bombed and therefore it makes perfect sense to tourists to rent bicycles to ride around it. The first night we arrived there was a big festival going on and the streets were buzzing with excitement. We stayed at a small B&B just outside the walls but spent the first evening in Tuscany wandering the streets and dining at an outdoor ristorante within the walls. 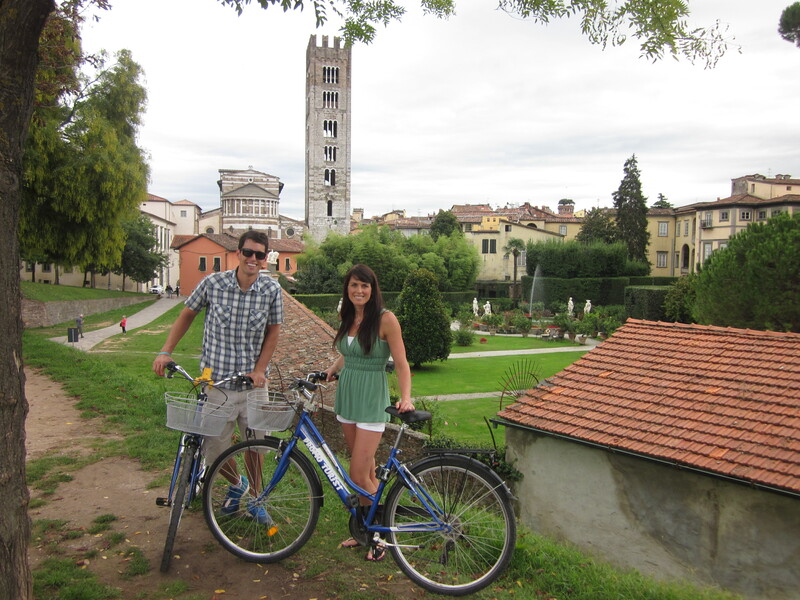 We spent our only full day in Lucca riding bikes along the ramparts, climbing a tower just for the view, taking in the frescos at the Basilica de San Frediano, exploring the many beautiful squares, and getting lost over and over again. 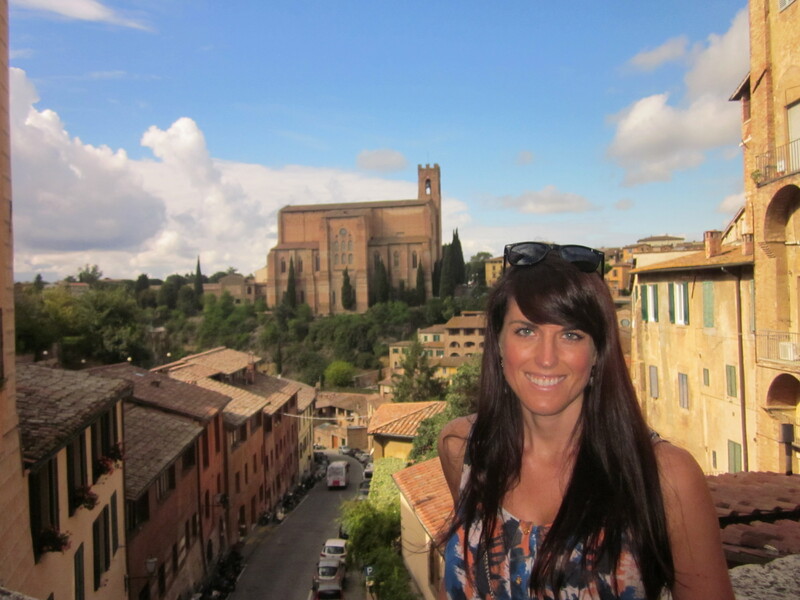 Soon we were on our way to Siena but not without a day trip to the hill town of Volterra. Volterra is known especially for its medieval and even dark feel (this is the town where the Volteri are supposedly from in the Twilight series) as well as its very ancient Estruscan arch which still stands quite discretely at the end of a long sloping cobble stoned street. We found an organic 100% vegetarian restaurant on the little street that led to the arch and had one of the best meals of the trip and definitely the most vegetables we would eat in one sitting during the entire trip. We also explored the Etruscan museum after lunch before continuing our journey to Siena. 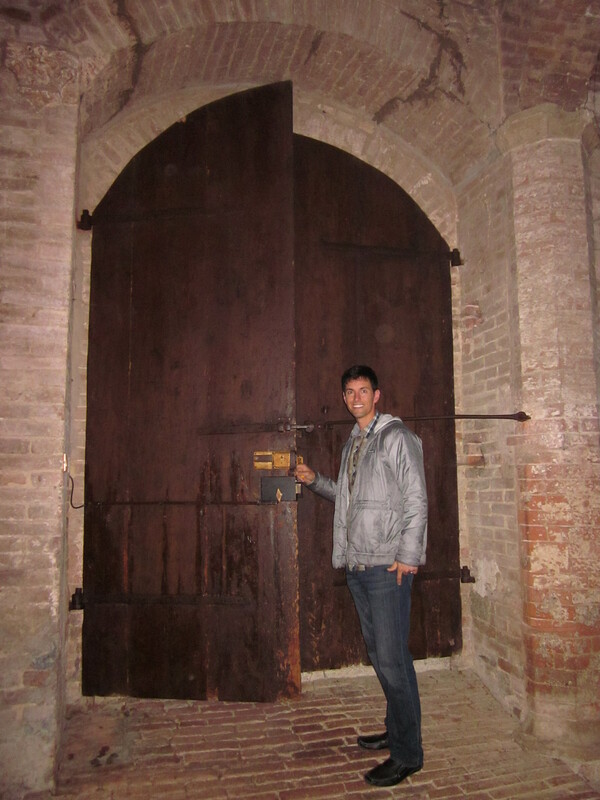 We wanted to close out the trip with a bang so we booked a castle as our accommodations for our three night stay there. Literally just outside our door was a massive stone courtyard which served as the foyer for the castle. The views from not only our apartment but particularly one of the four towers which we were permitted to use at our leisure were spectacular. 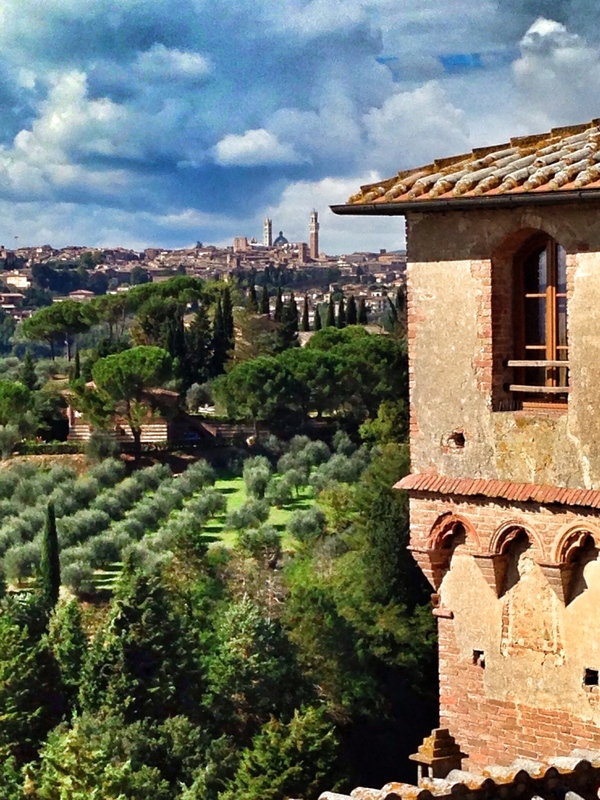 We had an amazing view of the lush Tuscan countryside with Siena rising out of the vineyards and olive orchards. Our first evening in Siena we dined at an upscale restaurant boasting a five course menu and live musician for the evening, recommended by the owner of the castle. We (again) got very, very lost attempting to find it but it was worth the experience. 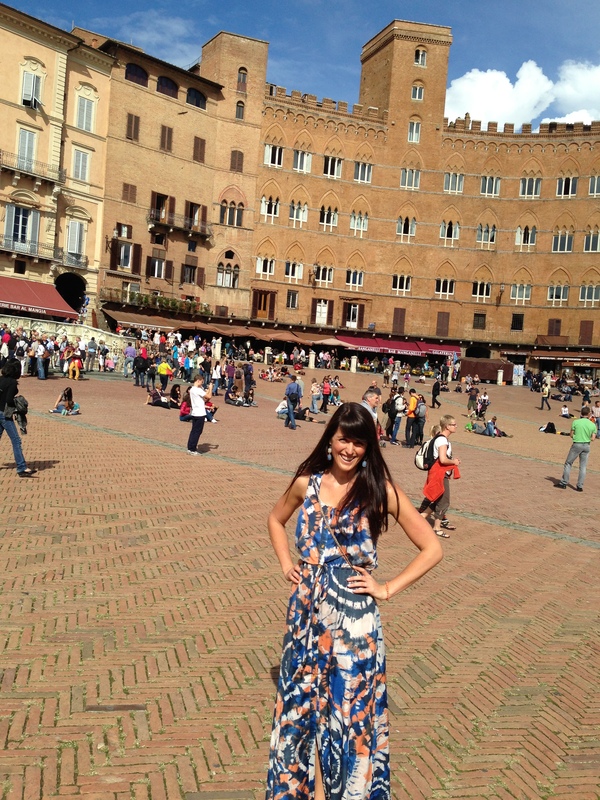 The next day we spent the day sightseeing in Siena – we explored the Duomo, the Duomo museum (and climbed the tower for the view), and learned that we could take a panorama with both of us in it on the iPhone at Piazza del Campo. We enjoyed glasses of wine during sunset at a small patio which overlooked the piazza which was abuzz with tourists, hawkers and even a bride and groom. Look! We’re both in the photo and we both took the photo! After drinks we headed to a restaurant that had been highly recommended by our guidebook and luckily we squeezed in without a reservation (restaurants open for dinner no earlier than 7 or 7:30 every night) by promising that we’d eat and be gone within 2 hours. We lucked out and got a seat in an old Etruscan tomb. 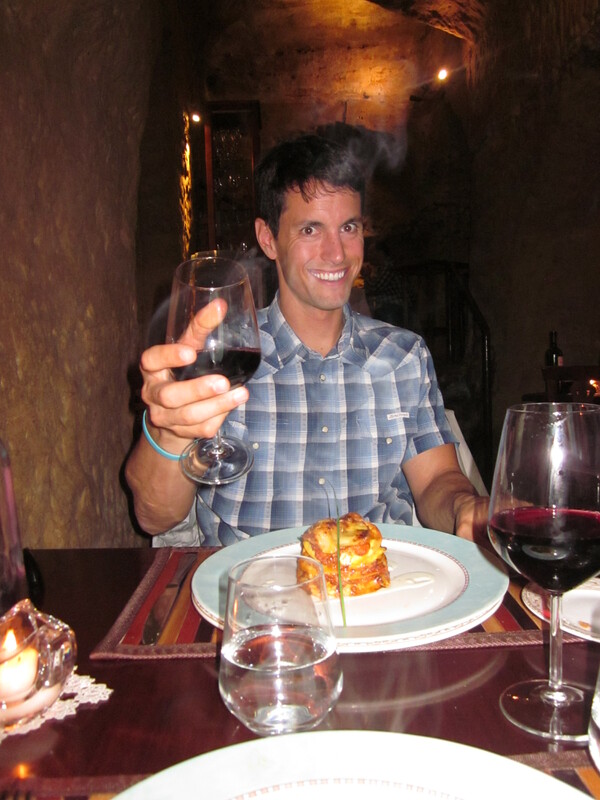 We ordered a bottle of wine, two gourmet appetizers including one with fresh truffles, two amazing entrees and dessert. 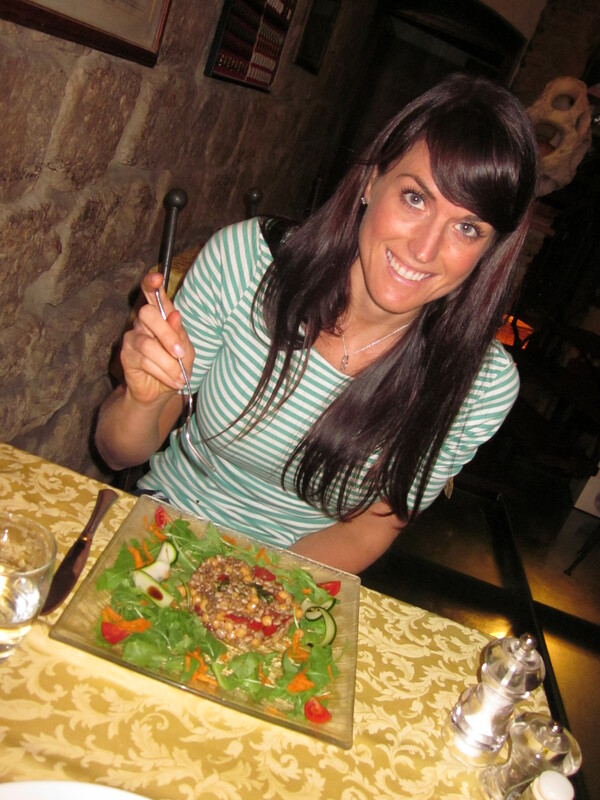 It was by far the most amazing meal of the trip – everything tasted so incredibly fresh and delicious. 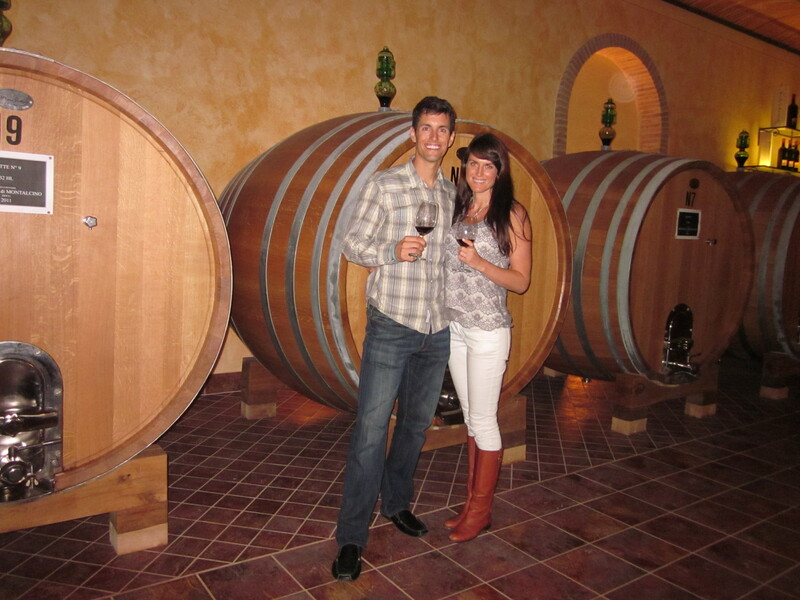 For our grand finale of the trip, we booked a full day wine tour of the Brunello wine region. We spent over 8 hours with our tour guide and three other tourists, first stopping at a cheese shop to pick out accompaniment for our first tasting. Luckily it was harvest season and we were able to witness the Italians picking the grapes as we drove to our first winery and then we were able to watch as the grapes were picked through and separated by hand in preparation for production. 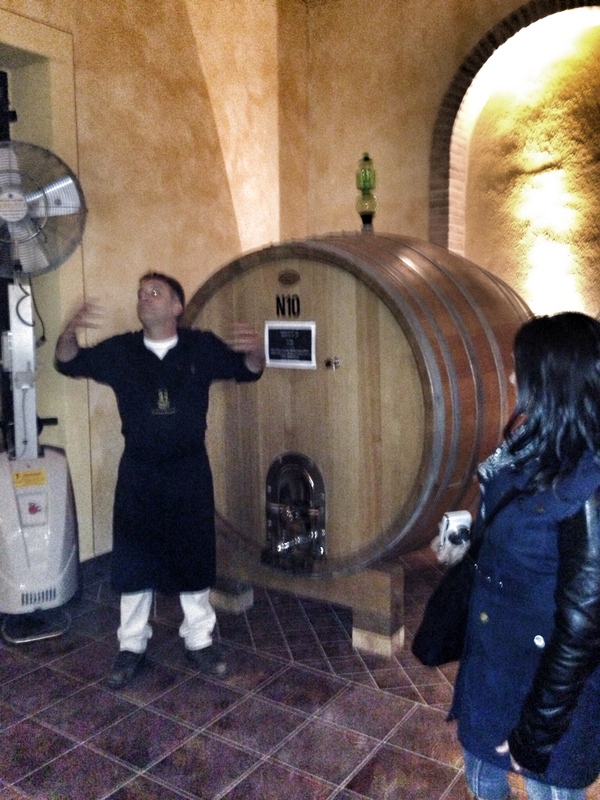 A woman who works at the winery gave us an incredibly interesting background on the Brunello di Moltalcino wine as well as a tour of the production facilities. 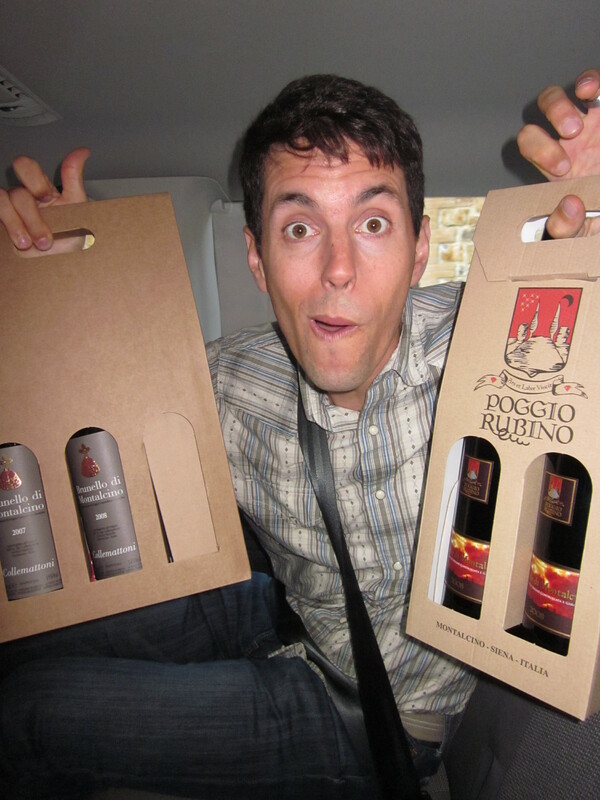 And of course, we were offered tastings from a variety of bottles, from a rosso (more like table wine) to the good stuff, a 2007 reserva bottle. We headed to lunch quite buzzed and happy from the generous tastings. We enjoyed a long lunch with more wine and socializing with our new friends before heading to the second winery. We were greeted by an overly loquacious guide who began ripping herbs off of the bushes and pressing them in our open palms, shouting things like “Smell the rosemary!” Smell the sage!!! Smell the BOAR!” as he explained that his wine contained all these flavors and was far superior as a result. It was quite entertaining – I literally felt like we were front row at a Broadway play. The tour and tastings followed but couldn’t surpass the entertainment of our welcome by our enthusiastic guide (we still mock him to this day as we sip our wine). We wrapped up our trip with one evening in the fashion capitol of Milan before heading back to the states. Our trip was something I will cherish for a lifetime and I couldn’t be more happy that we chose Italy for our luna di miele. Sounds like a trip of a lifetime! 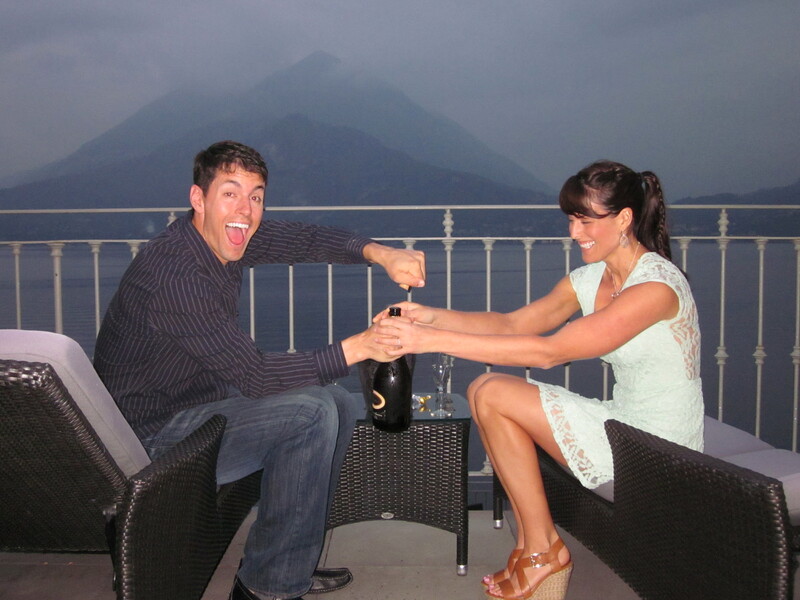 The photo of you guys at Lake Como with the champagne is fantastic! 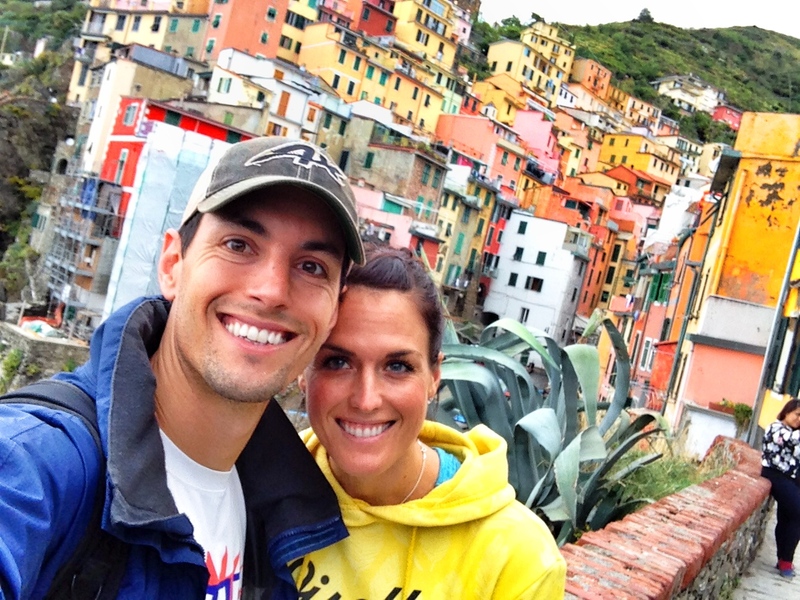 Any pictures I see of Cinque Terre make me want to go so bad, and now that I know how much you and Mike enjoyed it I want to go even more! WOW! Now THAT sounds like the type of trip ANYONE would love. Glad you two had a fantastic time!